38/40 Isaac John Street, Ikeja GRA, Lagos. NOSA: Folly told me a Marriott opened up on Isaac John and I didn't believe her. The street already has two big hotels on it, a third would be overkill. Someone built a Marriott on Isaac John. This restaurant is too expensive to be in the lobby. NOSA: I'm not going to lie, the place is beautiful despite Folly's issues. Ikeja has been missing an IT restaurant for a while now, and it looks like the steakhouse, CUT, at Renaissance Hotel is ready to fill that void. FOLLY: Their starters were incredibly weak. The only one we were half interested in trying, we felt didn't warrant the N9500 price tag so we skipped alladat and went straight for our main course. NOSA: The starters might be the only thing that disappointed me about this place. FOLLY: Nosa had the New York Steak while I had the Daily Surf & Turf. NOSA: The steak wasn't the most tender, well, compared to my ribeye at Talindo. Actually, that's a terrible comparison because a ribeye should always be more tender than a strip. The strip was as chewy as I wanted it and that slice of fat on the edge was the most delicious thing ever. FOLLY: The more crispy (read: burnt) part of the fat was even more delicious. NOSA: Another thing I loved was the chimichurri sauce (not pictured). It went so well with the steak. FOLLY: The daily surf & turf was a tenderloin steak and a salmon fillet. I selected the potato au gratin as a side. For the potato au gratin, the chef went with the sharpest cheddar he could find. I know this might not work for some, but it was absolutely delicious and tangy. 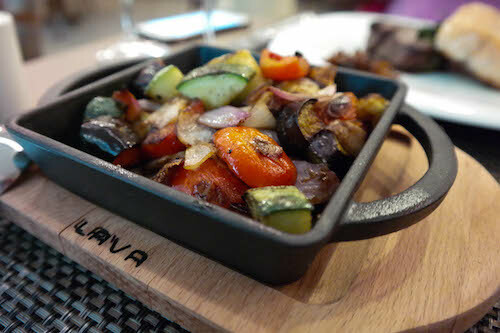 NOSA: I got the grilled vegetables with mine. Oh, you have to pay extra for sides. It so ludicrous. My grilled vegetables were great but not great enough to justify spilling an extra 2k for. But as I couldn't just eat a steak alone, I opted for it. FOLLY: The salmon was my favorite thing I had at the CUT. The hard and salty exterior was bae (see what I did there? #saltbae) and the inside was flaky but not overcooked that it was dry. I asked for my steak to be cooked medium and it was. It had just had a little bit of pink on the inside and less juices running through it compared to Nosa's. It was very tender (as expected because of the part of the animal that it's cut from), but it was desperately lacking in flavor. I hated my mushroom sauce (they used canned mushrooms), but Nosa's chimichurri was very much up to the task so I stole from him. FOLLY: Ikeja desperately deserves something that is better and bigger than Orchid Bistro. I mean, Orchid Bistro will still serve its quaint purposes, but before the Cut, if you wanted a more upmarket meal, there was nothing in the area. NOSA: I liked the food at Cut, but I hate the prices. Like Folly said, it's good as a treat. You definitely can't eat all the time regardless of what tax bracket you're in. FOLLY: Another thing I really liked about the Cut was that if you wanted a glass of wine, you're not limited to one cheap and unknown "house wine", but you can actually order most of their wines by the glass.